Heads of Rugby League International Federation (RLIF), Australian Rugby League Commission (ARLC) and Queensland Rugby League (QRL) will be in Port Moresby for the annual Prime Minister’s International match on Saturday. 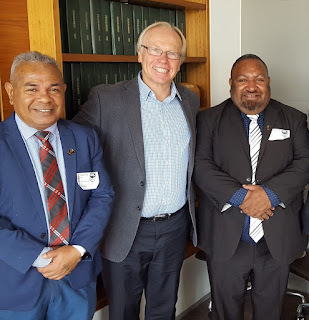 PNGRFL Chairman Sandis Tsaka said Australian Rugby League Commission Chairman Peter Beattie and QRL Chairman Bruce Hatcher arrive in Port Moresby tomorrow. “We will be meeting with the ARLC chairman later in the day to discuss issues of mutual interest on the game for both countries,” Tsaka said. He said RLIF CEO Nigel Woods and Asia Pacific Confederation General Manager Jeremy Edwards will be in the country on Friday. “We will be discussing among other things the calendar for more international matches for our National teams including the Kumuls,” Tsaka said. He said the visits by these dignitaries to PNG shows the respect and values PNGRFL has in the world. “On behalf of the PNGRFL, our partners and the extended rugby league family in the country, I welcome them to PNG and to the Prime Ministers X111 International matches,” Tsaka said.